Production Paint Finishers has a variety of capabilities that make up our core competencies to serve you better. Look them over below, then call us at (937) 448-2627 to discuss how we can serve your production needs. 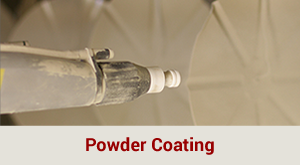 At Production Paint Finishing, Inc., we offer a wide variety of formulations, textures, gloss levels and colors in our powder coating lines. Whether you require smooth or textured finishes in a variety of coatings and colors, our expert staff will work with you to create the right solution to meet your project needs, no matter how unique. Our production facility is state-of-the-art and features a 12-stage pretreatment system that ensures proper adhesion and superior corrosion resistance for all powder-coated parts. When cured in our high-temperature oven, the finished product is beautiful and highly durable. Using many types of liquid coating specifications, Production Paint Finishers, Inc. ably meets your demands for high quality liquid painting. Depending on size, liquid parts run through our 12-stage pretreatment system. Or, if they are oversized, they will be cleaned and phosphated with our large part cleaning system, which features a wand-operated high-pressure washer. Why waste time and resources arranging to ship your products when we can handle it for you? 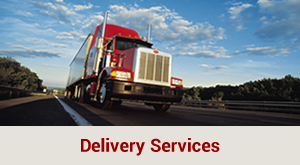 CDL-approved drivers operate our 24′ box trucks and semi-truck. We also have pickup trucks available for smaller shipments and can also arrange contract carriers to suit your needs. Production Paint Finishers, Inc. can meet most military (CARC) and commercial pretreatment cleaning specifications with our state-of-the-art 12-stage stainless steel parts washer and waste water treatment system. We do Zinc Phosphate on steel parts and Alodine 5900 on aluminum parts. If you have oversized parts, they will be cleaned and phosphated with our large part cleaning system, which features a wand-operated high-pressure washer. Production Paint Finishers, Inc. can provide assembly/disassembly services, apply hardware, final inking, stickers, and specialty packaging. We are not just a powder coating, liquid coating, sandblasting, military (CARC) and commercial solution company! What information do I need to provide to get a quote from PPF? 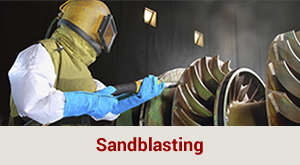 Prints, coating specifications, substrate, quantities per lot/annual, and masking requirements will provide the information we need to quote your powder coating, liquid coating, sandblasting, military (CARC) and commercial projects. What is the largest part that you can coat? 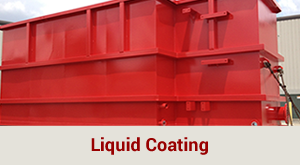 Liquid Coat – 40′ x 14′; If it can fit in our 16’ x 16’ x 40’ long booth, we can coat it. Powder Coat – 24′ x 8′; If it can fit in our 10′ x 10′ x 28′ long booth, we can coat it. What quantities of parts are ideal for you? Production Paint Finishers, Inc. is a high production facility, so 1,000, 10,000, on up to 100,000 piece jobs are ideal for all powder coating, liquid coating, sandblasting, military (CARC) and commercial projects. However, we are still a job shop and lower quantities of parts work, too. Note that we are not able to accommodate walk-ins for private individuals’ parts (i.e. bicycle frames, lawn furniture, rims, etc.). Commercial prototypes are no problem. How fast can you turn around my parts? Typically we quote a 5-day turnaround, but if we have coating material in stock, we have turned parts in 24 hours. This is not typical, but we try to help when possible. Yes, we have two 24′ foot box trucks and one semi truck that can typically pick up and deliver to locations within a 2-hour radius of our facility. Please contact us to determine our capabilities/capacity. Do you coat "Class A" finish (automotive, appliance grade, etc.)? No, we are a commercial-grade coater. All jobs have exceptions, but typically we determine price by a number of factors: How many parts per hour, part density, part spacing, material cost, weight, cleaning specifications, masking requirements, and packaging. The U.S. military relies on paint to achieve a variety of visual and mechanical effects, ranging from camouflage, to unit identification, and also the protection of metal surfaces. CARC-painted surfaces resist the absorption of chemical warfare agents, making decontamination much easier to accomplish. Chemical agent resistant coatings—CARC—make up the largest category of paints applied to the U.S. military’s inventory of equipment. CARC’s ability to conceal and protect improves the survivability of tracked and wheeled vehicles, artillery pieces and missile launchers, rotary and fixed-wing aircraft, and support equipment, such as communications vans, water purification units, generators, and forklifts.